Project BLAST – which stands for Balloon Launched Android Satellite Test – is about designing and building a cubesat utilising technology based on an Android smartphone, and then test it in near-space using a high altitude balloon. We are a group of 4th year students currently studying Aeronautics & Astronautics at the University of Southampton. As part of our degree, we are working on a Group Design Project (GDP) where we get the chance to make practical use of the knowledge acquired in the previous years. A cubesat is a 10x10x10 cm satellite, designed to perform tasks similar to standard satellites, for a much cheaper price, thanks to its very small mass (1.33 kg). Because of these characteristics, they are nowadays a very popular way for students to have their first hands-on experience in the design and manufacturing process of a satellite. We are aiming to create our own version utilising parts of a smartphone such as cameras, GPS, motherboard and so on, because they are very cheap (for space standards at least!) pieces of technology which are readily available on the market. Once the cubesat is ready, it will take measurements and pictures of the higher atmosphere, but we are also designing a short-range inter-satellite communication system using Wi-Fi, to allow for exchange of the above-mentioned data between multiple cubesats. 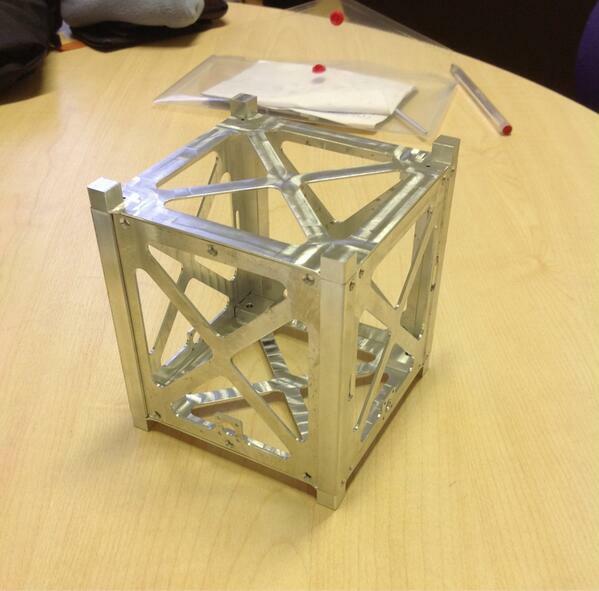 On 2nd March, 2013, the students successfully tested the cubesat on a weather balloon. The aim of the launch was to give the project group experience at launching and recovering a high altitude balloon with a payload. We also planned to fly SHARP in its modified form for the first time carrying with it the BLAST smartphone running the custom built application. Data from the smartphone sensors such as location and temperature was to be measured and stored for later analysis. The launch was arranged for 12pm, since there was a radio frequency clash with another launch from HAB enthusiasts in the Netherlands. However, problems with SHARP’s electronics meant that at 2pm SHARP was still not operational and, due to the few sunlight hours left for the day and the predicted landing site drifting further away, we decided to abort the launch of SHARP. Instead we launched two back-up trackers (Alpha & Fizzle). At 2.45pm we finally managed to launch. At 18km Alpha stopped sending data due to the absence of a flight mode in the GPS board which caused the onboard system to hang; however, Alpha kept transmitting a flat signal on the carrier wave. Later on, Fizzle completely stopped operating (this is believed to be due to the temperatures). We continued to move towards the predicted landing site, and we regained signal from Alpha as it fell below 18km. At 17.05pm the payload landed in the fields near Bexley, North-East of Oxford. The parachute (not designed for such a light payload) was entangled with the balloon and the strings, preventing it from deploying properly. This wasn’t deemed to be a problem to do the extremely low weight of the payload. While it was disappointing that the modified SHARP platform and BLAST smartphone were unable to launch on this occasion, the group gained a great deal of experience launching and recovering a HAB payload. We are confident that this knowledge can be brought forward to ensure future flights are successful.